We all dream about a flat stomach.Nothing will be wide shoulders or large arm muscles if our belly is forwarded more than the chest. 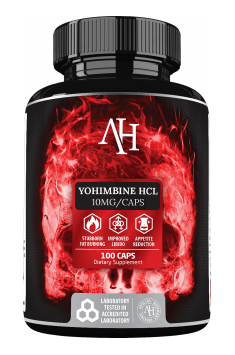 A clearly outlined six pack is a kind of determinant of good form.Unfortunately, burning fat from the abdominal area and thighs is the most difficult.Yohimbine comes with the help. Yohimbine is an alkaloid obtained from the bark of a tree.It is obtained from the tree of the genus johimba lekarska from the area of Africa and from the Asian bush ruawolfia.It has the form of a brown powder and may at first look like snuff.Interestingly, yesterday, yohimbine was known not as a fat burner, but … an aphrodisiac.It has strong stimulating properties, which according to folk medicine allows stimulation of libido.This action is the result of a better blood supply to the male organs. However, we will not deal with potency today and reduce body fat.In particular, we will look at fat burning in places considered difficult, i.e. on the abdomen (in men) and on the thighs (in women).What makes yohimbine work so well on areas of body fat, which may cause exercise and other measures to be ineffective? The source of yohimbine’s success, as in the case of libido, is its ability to improve blood circulation.Difficulties in fat burning in these areas come from, among others,weak microcirculation.For this reason, yohimbine is also known as a perfect means for cellulite.It is worth remembering that fat burning occurs in the presence of free fatty acids in the blood.In order for the free fatty acids to appear in it, they must first be released from the adipocytes, or fat cells, in which they are stored as triglycerides. Yohimbine increases the production of norepinephrine, a hormone transmitter secreted by one of the brain stem nuclei – the locus coeruleus.It plays a regulatory role and together with other brain structures, includingthe amygdala, is involved in triggering stress states.Separation of noraderenalin stimulates both the brain and the body, putting us into action and preparing the body for a fight or flight response.The effect of noradrenaline is, among othersacceleration of the heart rhythm, increase of body temperature, release of glucose and fat burning. In an emergency, all these reactions are designed to increase the likelihood of survival.The heart pumps the blood faster, the vessels expand more, and all this to provide as much blood as possible to the muscles and provide them with energy to run fast (escape) or fight.On a daily basis, however, we can use these possibilities to deal with the yellow fat tissue, which lies in the form of a tire.As a curiosity it is worth recalling that we also have a brown adipose tissue, called the winter sleep gland, which … helps to burn fat!This yellow, unnecessary.How to activate brown adipose tissue?Exercise in the cold (16 degrees C) or by adopting appropriate fat burners. 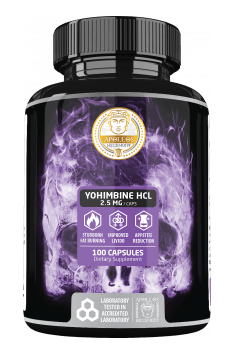 What dose of yohimbine should I take? In the supplementation application, we find non-pure yohimbine, and yohimbine HCL – yohimbine hydrochloride.It is a purified form of yohimbine, devoid of substances that may have a harmful effect on the nervous system.Although yohimbine is widely used, caution is advised as it has stronger stimulatory properties than e.g. caffeine.It is assumed that 0.2 mg of yohimbine can be used for every kilogram of body, but in practice lower doses are enough.It’s good to start with small doses, like 5 mg a day, to see how it affects our body.If you do not feel negative effects, that is, palpitations, anxiety or insomnia, you can gradually increase the dose, but not exceeding the maximum value resulting from the above formula. For the effectiveness of yohimbine, it is extremely important that you do not take any products that cause insulin release with it. Insulin inhibits lipolysis (fat burning process), therefore it is recommended to avoid consumption of yohimbina (and just before) of carbohydrates and protein.The highest effect of yohimbine will reach after an hour, and after about 3 hours there will be a fall in norepinephrine in the body. Yohimbine can be used by both men and women.It is worth remembering that it is not suitable for people with hormonal disorders, hypertension and depressive disorders.It is recommended for experienced gym goers who want to reduce body fat to a very low level. It is also worth remembering that yohimbine only supports the correct reduction, increasing its effectiveness.Accelerates metabolism, increases fat burning and suppresses appetite (reaction-fighting response).It also has a stimulating and pumping effect, so it can improve the quality of your workout.In itself, however, it will not bring the expected results if we do not precede it with the establishment of a proper diet or training plan.So, as always – we start with a sensible micha and heavy, multi-joint exercises.With them, yohimbine can work wonders.